SonicVenum wrote: I'm very annoyed that they left out any mention of the performance of the A10 in the different modes, other than mentioning drag mode. They said the auto kept you out of the powerband. That could be true of normal mode, but definitely not in Sport+ or Track mode. In those modes, upshifts are firmer, and the trans downshifts automatically on deceleration in order to keep you in the powerband on a windy road, or on the track. How the hell do you write an article about the performance of one transmission versus another without mentioning all the capabilities it has??? Lame. Tons of youtube videos of the 10 speed in action, but, the link was to a short review, not a full test. Jeff Smith already ran 11's on a strip in Florida with an auto 2018, and there is a video and story attached to that. Ford gave him the car to drive down to Florida, but, who knows if it was really dead stock, and, for sure, they had 93 octane in it. The 2018 Coyote has three knock sensors now, and extra fuel squirters and is quite sophisticated about sensing octane levels. Per Ford Racing, even an obsolete 2017, like mine, with only two knock sensors, is adept at sensing octane, and, last summer I frequented the 100 octane. VP Street Blaze. unleaded, pumps up in Lancaster, and blended up to around 97 octane, which made the engine feisty enough to convince me that it was actually picking up power. It even idled a bit differently, I suppose due to the changes it made to timing and also cam timing, as this is variable. However, at the end of summer, when I went back to 91 octane, it was an initial tough adjustment, as it does take some driving cycles for the computer to learn both the current octane and the driver's style, and per Ford Racing, and my own observations, the Coyote loves octane, up to around the 99 level, or so. After giving up on the expensive fuel mix, there was a period of detoxing, as at first, matting the throttle at 3500 RPM in second, for example, caused brief, but sharp, detonation, that was not there on 97 octane, but, now, that is long forgotten and the car runs correctly on 91 with no detonation issues. At $9 per gallon last year, and who knows now. I am avoiding race fuel, as it is a PITA to blend it up and maintain around a 97 octane mix, just for attitude, as I really never get on the car or race it. In any case, the reviews of the 10 speed auto tend to ignore all the modes other than the drag mode, as that is what the auto does best. One suspects that there is a reason why the Level Performance Package comes with a manual trans, as clearly they gave up a lot of potential performance with 7 gears ending in 1:1, but, unlike PP1, which is now an option with the auto trans for the first time on the 2018's, the engineers at Ford must have had good reason not to offer PP Level 2 with the auto. Or perhaps, they simply were genuine enthusiasts, as has been reported, and they knew that an auto was not a proper choice? And, yes, I know that a supercharged Camaro went around the rink at a record pace in drive, race mode, with its 10 speed auto, and all those rev matching downshifts and holding of gears worked darned well. But, although the design and engineering of the trans was shared, the GM version still differs from the Ford version. 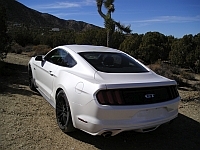 Still, Ford knows best, and, my attitude is old school, so no doubt, the 10 speed will be an enhancement for the less than 50% of the Mustang buyers that opt for an auto trans. And, the 10 speed should really work well with the turbo four, which now has 350 lb/ft of alleged torque to work with, as auto trans love torque by design. Now I am so rattled that I have to go for a ride in my car, with no destination in mind. That pretty much sums up my attitude, since most people do not take their daily driver out for a spin just because it feels, and sounds, so good to drive a nice American, manual trans, V8, with a decent custom exhaust and a 7200 RPM rev limiter. Also, a nice ride, and monster brakes for the first time ever on a Mustang that I have owned. I am getting my kicks while I still can, as the auto trans self driving nanny cars will end all that soon enough. This also makes me quite happy that I, and others, got in on the last of the many drag strips and drove in packs on the deserted roads of "Mexico" and still hit some curvy roads that had not yet been double yellowed and adorned with posted lowered speed limits. I went immersive with the '03 Terminator, and, some prudent people branded me as foolish, but, my memories of those times are still with me (and the induced poverty that immersive drag racing can bring), and, they were good times for sure, and worth all the costs, as these times will never come again. Auto trans? Get that Camary. I've found one video where a Canadian Ford dealer took a 2018 GT PP1 A10 to a track day in Toronto. The people that drove it there loved it on the track, though none of them were professional reviewers. It would be cool to be able to go to a Ford day like the Chevy event we went to some years back, and be able to drive various versions of the Mustang in a controlled environment. At the end of the day, I would still prefer to buy the M6, but unless I hear terrible things about it between now and then, I'd still consider an A10 if it ticked the rest of the boxes (i.e. color, interior options, PP1 or even PP2, if it was priced right). Either way, I think 1-2 years old will be the best way for me. I'm pretty much convinced 2018 is the way to go. Lots of upgrades over the 2015-17. Pat, me thinks you should take up the art of automotive journalism in your retirement years. You could get a press pass, and be able to drive all kinds of factory cars.